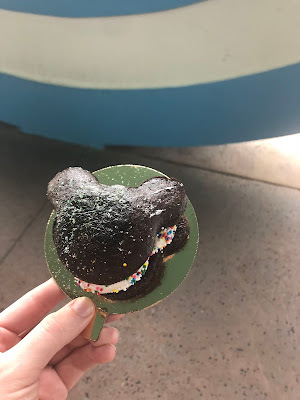 Soooo I committed a cardinal blogger sin when it comes to this post about Pop Century's food court offerings: I didn't take much in the way of photos. I KNOW. Amateur hour. In my defense, I don't usual eat at my resort's food court with much frequency, and I was caught by surprise when we hit up Everything Pop with the frequency that we did. Once I realized I had a post on my hands, it was practically too late. We picked up breakfast sandwiches on our first day, consisting of eggs, bacon, and cheese on a bagel (which I do not recall being toasted, although the whole thing was warmed). There were scads of these pre-made hanging out at the station, but it was actually pretty decent. Mind you, the scrambled egg was the usual mass-produced stuff and the bacon was, as per Disney standard, limp, but you can't really go wrong with the salty-fatty-cheese-y combo. It's not haute cuisine but it does the job fine. The night before the 10K we picked up my usual pre-race meal of a pasta kids' meal. Learn more to find out about its magical powers. Erika got a chicken parmigiana and did not seem unhappy with it. However, the night before the half marathon we'd been to Epcot to sample some of the glorious offerings at the Food & Wine Festival. We didn't quite want a full meal, but we did want a little something to fortify us before bed, so we chose a slice of cheese pizza to split. It comes with a Caesar side salad normally but we were able to request it on its own. This pizza is... fine. It is not even Domino's good, but it is frozen pizza good or maybe a slight step above? The cheese was melted, the marinara was not offensive, and the bread held it all together. Not a sophisticated flavor profile but an acceptable carbohydrate delivery system for pre-race purposes. For our lazy post-half meal we dragged ourselves down to the food court for lunch. I'm afraid I don't remember what Erika got but I went with the vegetable sandwich. This was a mistake. In fairness, the description doesn't mention much about it beyond the vegetables, cheese, and bread involved. But in my head I was picturing something more panini-like, probably because of the provolone cheese. Sadly, nothing about this monstrosity was hot, including said cheese. It was a massive collection of cold vegetables on bread. And not even fresh veggies either - everything was cooked or dried, and it was all doused in pesto. Together the flavors were entirely too aggressive while being impossible to consume together for an overall flavor profile. Soggy and cold all at once. Disappointed. Disappointed!!! And so we come to my final purchase of the trip: a whoopie pie. It was an impulse purchase by a sad girl about to leave her heart's home. How could I not? It's shaped like Mickey and covered in edible glitter! Unfortunately this was only okay. The chocolate cake portion was one-note and too thick, obscuring the inner spread of vanilla frosting. The frosting layer wasn't thin per se, but it wasn't thick ENOUGH for the cake-to-frosting ratio. Mind you, I wish EVERYTHING had more frosting, or, alternatively, just buy me a can of frosting and give me a spoon. But if I wanted something sweet at Pop I'd get a cupcake or something next time. Overall I find Everything Pop to be perfectly serviceable but largely uninspired. I think Landscape of Flavors across the lake at Art of Animation has more interesting options, although I haven't been there in a couple years so who knows. How do you feel about Everything Pop? Do you have any frosting? Can I have some?